Victor catches us a fish in morning, I share with him the Ceviche I made from it for lunch, and later in the day he comes by with an amazing homemade ball of cocao. He told us his father had made it from his own trees in a nearby town. Indigenous tribes used the cacao beans as a form of currency in Pre-Colombian times, and it continued to be a form of currency through the 1930’s. The Spanish sweetened it by adding sugar cane or honey. Fast forward to 1979 when a fungus wiped out 95% of the crops. These days, you can find the bean making a resurgence in the form of small batch farms and Cacao tours throughout the country. Health wise, it has more antioxidants than red wine, blueberries and green tea. The taste is quite bitter, so if you get your hands on some of the good raw stuff, here’s one suggestion of what to do with it. Grate cacao into a sauce pot. Turn the heat on med-low and add a small amount of water so that you can whisk it together and make a slurry. Once smooth, begin adding milk and all other ingredients. Keep it moving so that the milk doesn’t scald, If you’re really feeling froggy, throw some bailey’s in it! 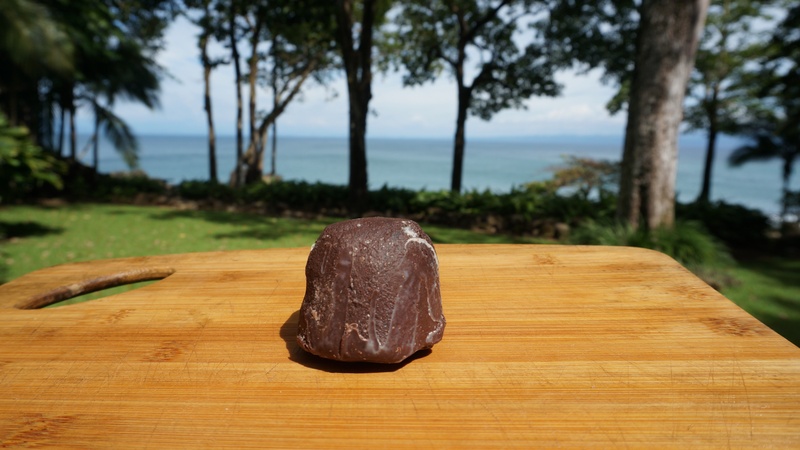 What would you do with a ball of raw cacao from Costa Rica?? !